No one can deny that cricket is a religion in our country. Indians are crazy about cricket. They eat, sleep, and drink cricket. Cricket craziness is back with the launch of the 9th season of IPLT20. You must be ready to watch IPLT20 cricket tournament. Watching IPLT20 is full of excitement and fun. Along with this fun and excitement, you can learn a valuable lesson of stock market trading from this game. So, let’s learn stock market trading with cricket craziness. IPLT20 is a fast game. The players are always in a hurry to either collect maximum run or take maximum wickets at the early stage. Along with speed, they need to be a focus and grab the opportunity as and when arise. In trading also trader has to act very fast. They need to be prepared and focus. As and when the opportunity arises they need to grab it to gain maximum profit. Every run is important in the game of IPLT20. Once the target is set by the opponent team chasing the target is a prime goal of every player. In the similar line, every rupee is important in the stock market trading. A good stock market trader set the profit target every day and work smartly to chase the target. The biggest barrier in IPL is time. That is the main reason why planning plays an important role while playing T20 match. Every team needs to do advance planning about batting order, bowling order, fielding, and multiple other things. Similarly, the Successful traders have a trading plan that they follow. The reason of creating a trading plan is to guard against the emotional swings that you go through when trading. The trading plan establishes a framework. The trading plan describes what to do in each scenario. A strategy plays an important role for the winning of IPLT20 game. T20 game is always unpredictable and exciting. A strategic play always helps in winning the game. A team needs to make various strategy based on pitch condition, score, performance, a wicket in hands, what to do while winning toss etc. Similarly, a successful trader needs to make trading strategies. These predefined trading strategies always help in managing finance well. The trading strategy must be made in a manner to reduce risk and increase a probability of profit. Once you set your trading strategies you have to stick to them and must try not to deviate. These strategies will help minimize your trading risks and prevent losses & helps you to reach a goal. In the game of IPLT20, the team needs to assess a risk level time to time and make changes accordingly. As a team, you need to decide what is working and what is not working. Similarly, in the stock market trading, one has to identify his risk level and stay within that risk limit. In order to earn a profit, one must prevent loss. For long term stock may give you profit but for short term one must see that stock will not end up giving a loss. A coach plays an important role in any cricket match. A coach gives training to all players about batting, blowing and fielding. Apart from this coach gives useful tips and strategy for winning a cricket match. In the similar line, trading mentor plays an important role in learning stock market trading. A trading mentor keeps you focus and give essential information about winning trading strategy. I hope stock market trading lessons learned from IPLT20 will be useful to you. 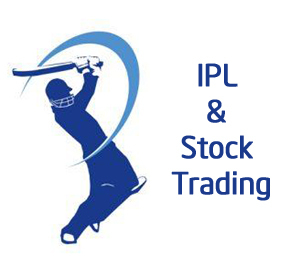 So, enjoy the IPLT20 cricket season and remember important lessons learned here about stock market trading. If I have missed any other important lesson which you have learned from IPLT20 cricket do share it in the comment section! « Lifetime Free Credit Card offer really worth to avail?